So many stars in the sky. So little you can touch. I prefer planet earth. Like in ‘down to earth’. Traveling across earth. China love, European hugs, Russian applause, African lip syncing. International groupies. Love is all around but when love is up close and personal, is it real? So, here I am back in the Ancienne Belgique with my little old polaroid. John Legend was in Brussels touring to promote his Evolver tour. I arrived a bit late so when I entered the venue, the front row was already fully taken. I was by myself, no P.I.C. to have my back. It didn’t feel right from the beginning. But, positivity is key, so I immediately got to work. I approached a couple front row and asked them if they could make some room for me and I explained them the polaroid project. They gave me the standard look – NUTS – but they were so nice to give me a spot right next to them. Or maybe it was just the giant camera that scared them, I dunno. A screen comes down. I see John Legend boxing in black and white. The screen slowly rises and there he was. Mr Legend himself. Honey voice. He was wearing shiny black trousers with DC grey sneakers, a white shirt with a slick tie and biker studded gloves and a shiny short black trench. Was the concert good? Yes. Does he have a magnificent voice? Definitely. Is he a talented musician. Most definitely. Did he touch me? For some reason, no. The night wasn’t ‘Legend’ary. My tricks did not work. Eye contact; failed. Wasted two Polaroids to get their attention. Didn’t work. Entourage talk went like this: “Do you have 5 minutes, for me please?” while I showed him quick what my intentions were. He wasn’t interested, basically, 5 minutes was too much of his time. He told me he couldn’t help me. I asked him if he could please tell Mr Legend about my project, and I would be waiting for him in case he came back. He didn’t come back. I gave up. It was useless. Was I losing my ‘touch’? I went to the bar and ordered a beer. The bar was already empty. Nobody really sticked around after the concert. I noticed that the entourage is leaving just like the public through the front entrance from the AB. I looked outside and noticed the tour bus waiting just in front of the door. Suddenly my hopes were rising again. This means, John Legend was leaving the same way like Ordinary People do. The front door. Suddenly a door opens. His giant mean bodyguard leads the way. He leaves with his head looking to the ground, a big jacket with a fur cap on. A tall beautiful woman escorts him. The type of girl you see in the movies. I don’t hesitate since this was my final shot. I walked straight up to him and asked: “Hello, sorry to run up to you like this but,…” The giant mean bodyguard yells something at me and Mr Legend keeps on walking. I guess this meant no? I was a bit surprised. The bar was empty. No hysteric females. Just me and a fan with a poster and a pen. But for some reason, he walked out of the venue with his head down like he walked out of The Viper Room in L.A. (back in the old days), hunted and attacked by a pack of hungry paparazzi wolves. He must have been really really busy. 3 days later: I’m back again. Same venue. Same place. Different people. Q-tip’s first time in Belgium. To be honest, I promised myself to first enjoy the concert. The Legendary night with John was still under my skin and my confidence was down under: Zip, Zero. I arrived on time and walked into the AB-venue that is starting to feel like my second home. There was something different about the place. No fences. For the first time since I started this blog, I could touch the stage. Now, this was strange. People could just jump on stage if they felt like it. I took a sip of my Stella and waited it out. Jules was there. Convincing me that everything would turn out just fine. I was not convinced. The band takes place behind their instruments. Relaxed. The music starts. The beginning of the coolest evening ever. He came on stage with his back towards the public. He is instructing his band like a Concert Master leading his orchestra. The crowd loves it. He turns around and legendary hip hop begins. Less is more and Q-tip is living proof of that statement. He was wearing dark IceCream jeans with a wite Ralph Lauren shirt and underneath a Ralp Lauren wife beater and to top off his look, silver BAPEs sneakers. Simplicity and freshness. He gave his àll. Spitting lyrics like AK47. You just feel that this is what he is born to do and it’s beautiful. He combined new tracks from his highly reviewed and much anticipated ‘The Renaissance’ album with some ‘A Tribe Called Quest’ classics. Can I kick it? Yes You can! He talked to his public, telling them he was sick, but still wanted do the concert, and wondered if he was ever in Belgium before? It’s so cool to see an artists that just loves being on stage and is clearly grateful for the people to come and see him. He climbed on the sound boxes, he jumped in the crowd with barely any security, he didn’t mind people touching, he sang from the hart that ‘Life is better’ and the crowd believed him chanting word by word with him. Q-tip left the stage. But the band, well, they didn’t. Normally the artist goes first and the band quickly follows. If you’re lucky, some take time to greet the audience, most don’t. I only saw it once, with The Roots band members, who really took some time to sign autographs and pose for pictures for the people front row. Now this band wasn’t really planning on getting the hell out of there. No, they put down their instruments and jumped of stage to talk to some fans. I was amazed. One bass player walked by me and I went for it. I introduced myself and asked him if he got 5 or even better 2 minutes? (5 minutes is mostly too much, I’m not kidding.) Sure, he said relaxed, and sat down next to me. Hmm. Strange. I explained him my quest and he looked at the other artists with great interest. “So, I guess you want to take a picture of ‘Chip’ than?” I replied him in my best polite English: “Yes, I would love to…” “Stay here, I’ll come and pick you up in 5 minutes to go backstage.” And then he went into the crowd, talking with fans and signing autographs. 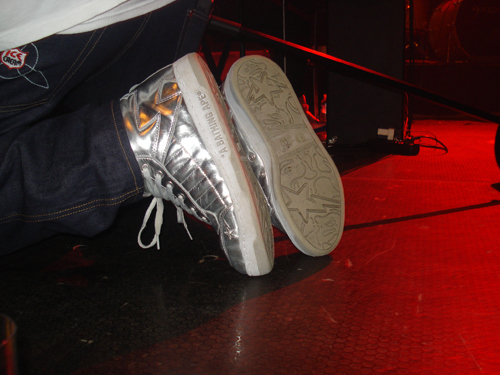 While I was waiting, the other bass player jumped off stage and landed next to me. He was kinda cute with very very long dreads and blurry eyes from that apple pipe he was smoking during the show. He gave his hand and introduced him as ‘Joshua’ and took off his jeans jacket. Then he took of his T-shirt. He was standing there in a white wife beater. He gave his t-shirt to a fan that went totally nuts with gratitude. Joshua looked at me, smiled like he was telling me: “Oh well, another happy fan.” I’m telling you, Jules and me were melting like a Sunday ice cream. Then it was time to go. As promised the bass player took us backstage. We were not alone, they took 5 girls with them as well. He told me to nòt approach Q-tip immediately, and to be chill and wait out a good opportunity to ask him permission for a picture. I hear the girls calling their mother, brother friends and the rest of the universe, yelling through the phone that they were backstage with Q-tip. Me and Jules? We sat down on a chair, shut our mouths and be good girls. Q-tips security passes us by. He stops, looked at us two ‘old missy good shoes’, smiled and offered us some red wine. He opened a bottle and gave us some. Suddenly a door opens and we see Q-tip kissing a tall stunning lady good bye. The door closes and she turns around. A surprised ‘Oow’ leaves my throat. It was Marie Daulne, front lady and singer from ZAP MAMA, a Belgian band that brings a mix in Afro-Soul and is very well respected in the urban music scene. 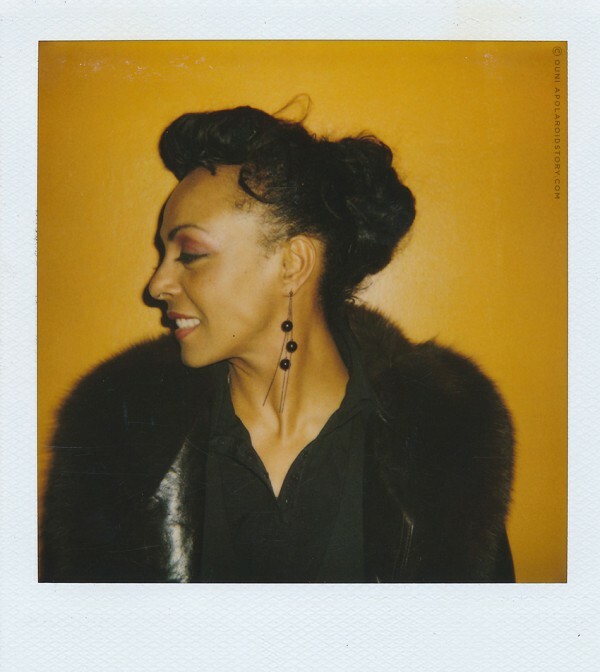 Zap Mama worked with the best (Bilal, Erykah Badu to name a few) and her next album will be launched in may 09. I didn’t hesitate and asked to her to pose for me. She had no problem with that what so ever. Jules told him to come over and said: “Hello, could you please come closer, she has to tell you something, it’s about a project.” For some reason I always die a little bit when this moments accurre. He came closer and I introduced myself, showed him my Ipod-Touch and explained him the project, while showing him the pictures I already took during the concert. I explained him that it was really important that I ask the artist myself and that they give their permission to mé. So I formally asked (extremely shy btw): “Can I please snap you on my polaroid?” He smiled and replied: “Yes”. The moment he said yes, it was action time. I explained him that I need a clean wall and some light. Jules suggested we take the picture in his backstage lodge. He looked at us and laughed, it was obvious we were flipping our brains out. He took us in his backstage lodge were his manager, his dj and some bandmembers were hanging aroud. He looked at me, waiting for some instructions. “Now, this is the deal, you pose the way YOU want to, if you want, you can give me some expression, but if not, staring in the lens is just fine.” Everybody started laughing, including him. What can I say, sometimes me being weird is òr embarrassing òr a great icebreaker. “Ok, here we go, 1, 2, 3 and snap. He gave his best smile. Normally I try not to waist polaroids on myself. Things can change quick and if you ask to much pictures the artist gets annoyed. Which is normal. But if the vibe is good, with some artists, I just can not resist. Questlove was one of them, and Q-tip is a pretty good second. I asked him with red blushing cheeks if he would please pose with me. That too was not a problem. Then it was time to go, we said our goodbyes and shook hand with the band. I turned towards Q-tip and thanked him once more and give a hand. He turned down my hand, grabbed my shoulders and gave me three kisses and a hug. No handshaking for him.This was the first time, an artist kissed me goodbye, and it came from the hart. Now, I’m telling you. I was feeling dizzy afterwards. With a red face ofcourse. Right before I left I thanked the bass player who took the time to listen to me and took us backstage. “Thank you, because in the end of it all, it was because of YOU.” We left the backstage with a warm feeling inside. All shook up. 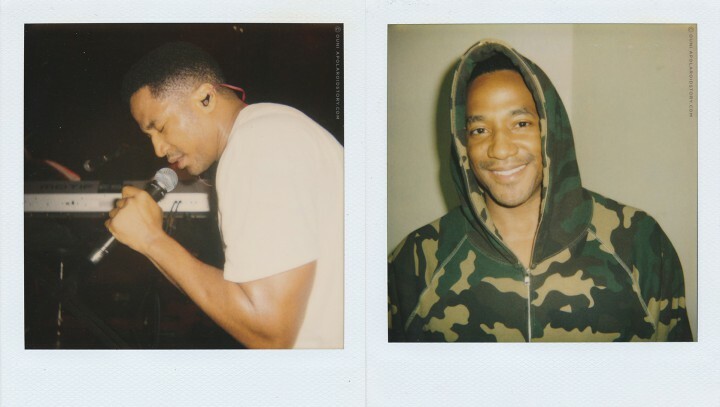 For me; Q-tip is a true star. One you can touch.